Basic fabric slings are best for everyday, frequent use. Simple and sophisticated or colorful and bold, these fabrics are lovely unadorned, or you can add a tail accent to spice things up a little. Please note: every wearer will have her/his own weight tolerance. 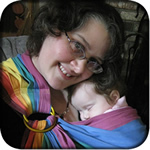 The slings will hold up to at least 35 lbs, but your own body may not.